Who? Online journalist and digital projects co-ordinator for Bournemouth Daily Echo. What? She keeps a blog, SubbedOut, and tweets regularly with her personal take on journalism. This entry was posted in Online Journalism, Recommended journalists and tagged journalist, online journalist, Samantha Shepherd on June 29, 2009 by Judith Townend. Reporters Without Borders (RSF) is hailing the release of online journalist Raja Petra Kamaruddin, the founder and editor of the Malaysia Today. Also known as ‘RPK,’ Kamaruddin had been detained since September 12, under section 8 of the Internal Security Act (ISA), which allows detention without trial for two years. This entry was posted in Editors' pick and tagged editor, Malaysia Today, online journalist, Raja Petra Kamaruddin, Reporters Without Borders on November 10, 2008 by Judith Townend. As the UK government announces plans for crime maps for offences in England and Wales, Kristine Lowe reports for Journalism.co.uk on how Danish paper Berlingske Tidende is using its own map as a source of news and a public service. “Crime mapping is getting government push behind it, even if police are resisting,” wrote the Guardian’s technology editor Charles Arthur this week, as the government announced plans to publish local interactive crime maps for every area in England and Wales by Christmas. In Denmark the national daily Berlingske Tidende is already pioneering the use of crime maps as part of the newsgathering process. With the help of its readers, the paper has created an interactive crime map detailing how well the police responds to calls from the public. “We have just had a major police reform here in Denmark and decided to investigate how this has worked. The politicians promised more police on the streets and more money to solve crime. We thought the best way to check the reality of these promises was to get our readers to tell us about their experiences,” Christian Jensen, editor-in-chief of Berlingske, told Journalism.co.uk. The reader reports are placed on a Google map of the country and, since its launch in May, 70 crimes have been reported and plotted. 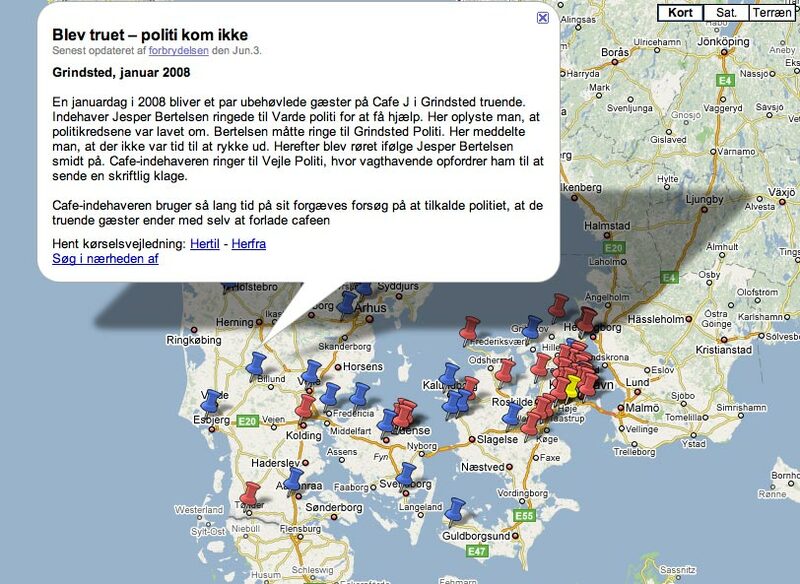 One of the crimes reported to the map related to the alleged murder of Danish woman Pia Rönnei. Despite available patrols in the area, the police force did not send officers to investigate calls from neighbours, who reported screams and loud bangs from an apartment that Rönnei was in – something it has been forced to apologise for after the publicity the story received. “In classic journalism, it is the journalists who find the stories. In our new media reality, it can just as well be the readers who alert us to issues they are concerned about,” said Jensen. The newspaper has had two full-time reporters devoted to the project, and used an online journalist, photographer and production company (for live pictures) in stories they have devoted additional space to. “We encourage people to get in touch with stories both in our paper edition and online, as we see a substantial increase in web traffic when we draw attention to the project in the paper edition,” Jensen explained. Every single crime report on the map generates the same amount of web traffic as breaking news, he added. The project has been so successful that the newspaper is preparing to launch another project in the same vein. In the next few days Berlingske will unveil a database on immigration politics, where readers can tell their own stories and read and comment on each others’ accounts of their experiences with immigration authorities. This entry was posted in Online Journalism and tagged Berlingske Tidende, Charles Arthur, Christian Jensen, Christmas, Denmark, editor-in-chief, google, Journalism.co.uk, Kristine Lowe, Mapping, media reality, Online Journalism Scandinavia, online journalist, photographer, Pia Rönnei, Politics, technology editor, The Guardian, UK government, United Kingdom, Wales, web traffic on July 30, 2008 by Kristine Lowe. We give developers the opportunity to tell us journalists why we should sit up and pay attention to the sites and devices they are working on. Today, live video streamed over the web with extra geographical information mapped in real-time from Seero. Hello, I’m Justin Cutillo, co-founder of Seero. It’s a geo-broadcasting platform that fuses live and on-demand video with GPS mapping. Our technology is a response to the convergence and proliferation of video and GPS features in the flourishing mobile device market. Seero was built to reflect the core needs of video bloggers and online journalist. The platform incorporates tools for live mobile broadcasting with additional real-time GPS tracking and static location marking. We also have a geo-information/advertising server. This system allows us to geo-tag specific information to enhance any broadcasts near that location. For example, if an online journalist was covering a fire in London, we have the ability to upload facts specific to the building and geo-tag them to the exact location. The information is served based on its proximity to the location of the broadcast. All you need for mobile broadcasting is a laptop and a mobile broadband card. You can add on an inexpensive GPS receiver for the real-time tracking feature or use an Ultra Mobile PC is you don’t want to carry around a full laptop. We are currently working on some major build items. We should be releasing an embeddable flash player that includes the live video player and the full map functionality within a month. We are also working on a module to add course tracking to previously recorded videos. Our largest project is to build a mobile broadcasting application for Symbian mobile phones to enable journalist to broadcast live video and GPS right from their Nokia phones. Beyond that we have a secretive project that could really redefine how people interact with live video on the internet. When it comes down to it we are technology buffs. We came up with the idea on a vacation to San Francisco more than two years ago while thinking of ways to virtually tour a city. Combining live video and location info opens up new, exciting uses for online video. Needless to say we are very enthusiastic about the prospects. Besides the hardware cost, which may be very little if you already have a laptop, the service is completely free to all users. We currently envision three main channels of revenue. The first channel involves white label sites built on the Seero infrastructure for promotional as well as professional and government services. The second channel is geo-advertising. We have a proprietary geo-advertising system that provides a simple and powerful solution for correlating advertising to site content. Beyond those revenue streams we also see potential for our geo-advertising system as a stand-alone service. This entry was posted in Broadcasting, Mobile and tagged bloggers and online journalist, broadband, co-founder, Cutillo, Data journalism, Digital video, geo-advertising system, geo-information/advertising server, Geotagging, government services, GPS, Innovations in Journalism, journalist, live video player, London, Mapping, mobile device, mobile phones, MoJo, online journalist, online video, San Francisco, Seero, Symbian, technology buffs, Video on April 21, 2008 by Oliver Luft.